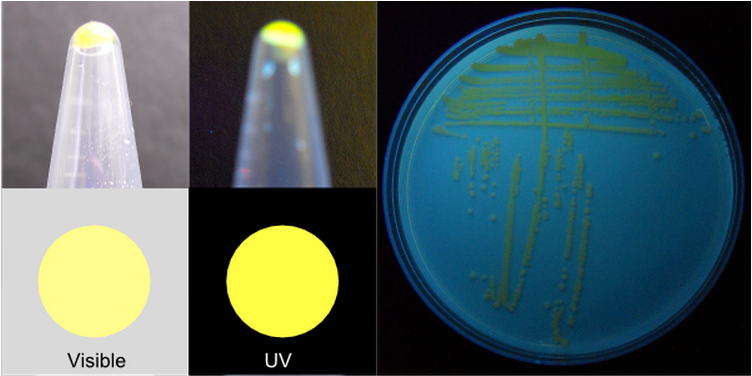 IP-Free BlazeYFP (Yellow Fluorescent Protein) This part was created by DNA 2.0 as part of their IP-Free series of fluorescent and chromogenic proteins. It is available to use under the BioBrick Public Agreement. 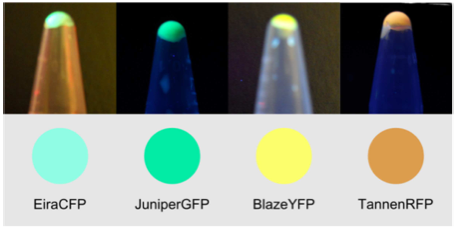 BlazeYFP appears yellow to the naked eye and also appears yellow under UV light. DNA 2.0 created a poster to show how the parts were created which is available on their site here. The creation of the collection is summarized in the sections below. Fluorescent and chromogenic proteins are a valuable tool for research, with uses ranging from reporters in transgenic systems to biosensors. The tangle of intellectual property restrictions, as well as protein characteristics like brightness, spectral properties, oligomeric state and sensitivity to environmental conditions, limits the breadth of tasks to which fluorescent and chromogenic proteins can be applied. DNA 2.0 has created a large set of new colored and fluorescent proteins by backtranslating a set of sequences from Genbank, using GeneDesigner software to simultaneously minimize sequence differences and match GeneGPS derived E. coli codon bias for high protein expression. Gene fragments were designed to create chimeric genes when pooled. A subset of the resultant chimeras were selected as base genes from which multiple iterations of libraries with targeted substitutions were made. Each reiteration involved characterizing variants for spectral and sequence data which was analyzed to infer correlations between them. Correlations were then tested by creating specific individual sequences and determining whether their spectral properties were as predicted. Three amino acid positions were found to be individually responsible for cyan, green or yellow fluorescence emission. They also identified variants with non-overlapping spectra as candidates for applications using more than one fluorescent protein, for example microscopy and FRET (Fluorescence Resonance Energy Transfer) applications. 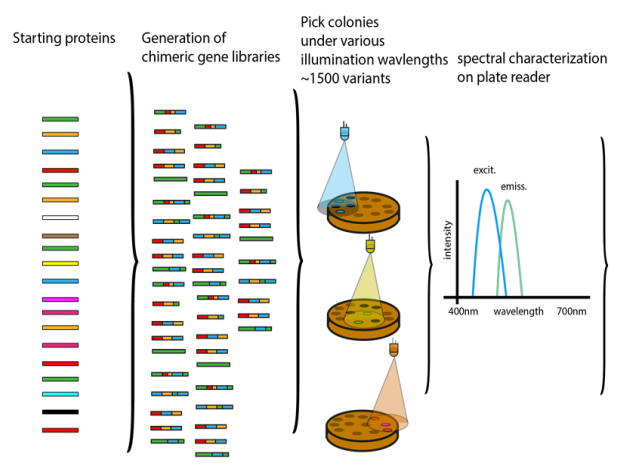 The basic approach used by DNA 2.0 to create the collection is described in the figure to the left. Genes encoding the starting proteins were backtranslated using GeneDesigner to simultaneously minimize sequence differences and match a GeneGPS derived E. coli codon bias. Oligonucleotides were designed to synthesize each gene in fragments, and subsets of these gene fragments were combined such that synthesis created chimeric genes. The resultant chimeras were cloned under control of the PTrc or PT5 promoters, and fluorescent colonies were picked under various illuminations. Excitation and emission spectra were recorded from pelleted cells resuspended in a transparent buffer using a fluorescence plate reader. DNA2.0’s IP-Free© synthetic non-aequorea fluorescent proteins are intended to be used as a source of different fluorescent protein coding sequences (genes) that can be amplified by PCR and cloned into any other expression vector of choice. This part was contributed under the BioBrick Public Agreement (BPA). Click on the BioBrick Foundation logo to see more information about the BPA.